My entire life, I’ve been in awe of violinist, Itzhak Pearlman, never having known music without him. My late mother was a childhood prodigy violinist, including having been among the youngest members of the San Francisco Symphony. What made her story even more remarkable was that her father was in prison, and her mother was a heroin addict and prostitute. My mother told me how when she came home from school on days when her mom was shooting up, she’d go in her room and practice the violin for hours, making any pain from her home life float away with each note. However, as these stories too often unfold, by the time my mother was 19, she was pregnant and living in Germany with my father who was stationed in the army there, right before he headed to fight in Viet Nam. And, through my mother’s subsequent personal demons like alcoholism, she never picked up a violin again. Still, her entire life, my mother loved the violin, and even in her darkest days decades later, she could shut her eyes, dazed on the couch from a pint of vodka, and astoundingly recall every note of an all-Beethoven program, humming it as though, in her mind, she was 15 again, in a beautiful gown, sitting upright on stage, playing every note on her beloved violin. As I grew up, it was undeniable to me even at a young age that my mother’s destiny as a concert violinist was tragically derailed – partly by uncontrollable circumstance, partly from her own horrendous decisions. Still, among the greatest gifts that my mother shared with me was violinist, Itzhak Pearlman. 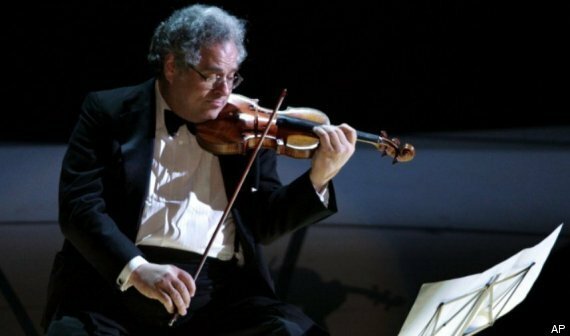 For my mother and me, Itzhak represented our two worlds combined – that is, the violin and disability. See, as most know, Itzhak isn’t just among the greatest violinists of our time, but a polio survivor, relying on leg braces, crutches, and a mobility scooter. I remember being in my manual wheelchair – maybe I was six years old? – meeting Itzhak back stage after a concert, a meeting somehow arranged by my mother. He awkwardly walked up to me in his cage-like leg braces, stopping directly in front of me. He seemed not just larger-than-life in spirit, but in physicality – a giant of a man, as if his head touched the sky-high ceiling of the auditorium. Itzhak looked down at me, smiling, grasping my chin with his hand. “Handsome boy,” he said with an accent. Then, Itzhak placed his hand on my forehead, closed his eyes, and said something in a language that I didn’t recognize. Was it a prayer? I’ll never know what Itzhak said to me that day in a langauge that I didn’t understand, and what’s even more puzzeling to me today was how my mother arranged the meeting – I never thought to ask about that extraordinary event prior to her death. Nonetheless, what I recall most about meeting Itzhak was that his presence was easily defined through my eyes as a child: Greatness. Maybe it was the connection to my mother, or maybe I was at an impressionable age, but no other person has struck me with the true sense of greatness that I recognized in Itzhak – he has charisma beyond what can be explained. And, when witnessed in-person, his spirit is all-consuming. On November 8, 1995, an entire audience got to witness Itzhak’s divine spirit first-hand. Like any other concert, Itzhak came onto stage with his crutches, took his seat, put his violin to his chin, and began playing. But, after the first few bars – strokes of his bow – a string broke on his 1714 Soil Stradivarius violin, the pop ricocheting through Lincoln Center’s Fisher Hall. In such a circumstance, a violinist must grab another violin or re-string the instrument, as such complex compositions can’t be played on three strings – or so anyone thought. However, rather than stopping, Itzhak continued playing – the whole symphony – never missing a note. He re-modulated and recomposed each piece in real-time, in his head, redefining the arcs of his bow to eliminate the need of the fourth string. The mesmerized crowd leaped to ovation at the end. Did Itzhak really play an entire symphony concert on three strings? No – again, it’s an urban legend. Yet, there’s absolute truth in the fact that it should be all of our tasks to find out how much we can accomplish with what we have left at any point in life. Maybe we face disability, an ended relationship, a job loss, or a tough business climate – the list goes on and on. During such circumstances, our only question should be, how much can we accomplish with what we have left? The answer, as we can each demonstrate in our daily lives, is: we can accomplish more than most can imagine. Thank you for this article, Mark. Sharing your memories of Itzhak Perlman stirred up my own memories. I was very blessed and privileged to be able to attend one of his concerts at Wolf Trap while I was living in Virginia. While that was at least 20 years ago, I can close my eyes and almost once again feel the enjoyment of being in his presence and listening to his beautiful music. It is so tragic that your Mother was not able to follow a career as a violinist. At the same time, what a blessing. Had she have been a career violinist, we might not have you. Awesome perspective, Mark. I am enjoying your essays very much, after reading your book many years ago. Thanks! I’ve known you how long now and I am just now hearing this wonderful story? Thanks for sharing. Thank you Mark, I got shot 18 years ago, am on a vent and have lost quite a bit of ground over the last year. I am going to quote ” Our only question should be, how much can we accomplish with what we have left? ” That’s going on the wall across from my bed. Next Next post: Breakdown or Breakthrough?